Last week, I attended the Microsoft Management Summit in Las Vegas, which is a show that neither Brian nor I have ever attended. In the past, we looked at it as a server management conference, just outside of the scope of what we cover on BrianMadden. Last week, I attended the Microsoft Management Summit in Las Vegas, which is a show that neither Brian nor I have ever attended. In the past, we looked at it as a server management conference, just outside of the scope of what we cover on BrianMadden.com. This year, however, we decided to give it a shot based on the recent news surrounding Microsoft's desktop virtualization initiatives. As far as the keynotes were concerned, Day Two was the day that I really cared about. Day One consisted of a lot of broad management stuff (as expected at the Microsoft Management Summit), but very little of it fell within the realm of desktop virtualization. Among the things talked about was Opalis, which is a process automation company that Microsoft purchased back in December. There was also a bit of ambiguous cloud stuff that sounds more or less like what every vendor is saying about the cloud. If you're curious, you can watch the Day One keynote here. The Day Two keynote (available here) from Brad Anderson brought the desktop goodies, though, and early on we learned that Microsoft wants to manage virtual desktops the same way as a traditional desktop infrastructure (which is why I was there in the first place). Microsoft considers "desktop virtualization" as the umbrella term encompassing application virtualization (App-V), presentation virtualization (RDS), hardware virtualization (Hyper-V), and VDI. This is also great to hear, because that's the tune we've been singing for quite a while. A slide from the Day Two keynote. Next, we took a look at the new XenApp integration into SCCM, which will be available in June. For XenApp customers that are currently managing their environments from two systems (that is, XenApp and SCCM), it's a pretty big deal. We saw a demo of deploying an application package (which can be MSI or App-V) to XenApp servers, then publishing the application on the XenApp farm, all via SCCM. The demo even went so far as to show the app appearing in Dazzle. If you want to see the demo, skip to 21:45 in the Day Two keynote video. This is the final nail in the coffin of the whole "Citrix is competing with Microsoft" thing that we've talked about in the past. Citrix and Microsoft are most definitely friends, and Brad even went so far as to ask all the people that work as SCCM and XenApp admins to get together and take advantage of the new integration capabilities. I'm left wondering how it feels for Quest, who is the "other" partner that Microsoft has for desktop virtualization. It's clear they have a good relationship, but I hear less about that relationship (from Microsoft, at least) than I do the Citrix relationship. After the Citrix conversation, we saw demos of both Dynamic Memory and RemoteFX. Dynamic Memory isn't memory overcommitment, rather, it's a method of configuring virtual machines with a default and a max memory setting. Machines start with their default setting, and a pool of memory provides the machine with more memory as needed, up to whatever the max setting is. As a VM's memory requirements go down, the memory is returned to the pool. I don't know how this pool is configured beyond some automatic process that adds up the default requirements of all the VM's on a host and subtracts that from the amount of memory in a system, but it's something I want to find out. If you know, please leave a comment. Otherwise, look for an article in the near future. In the meantime, follow these links (Part 1, Part 2, Part 3, Part 4) for a fantastic set of articles explaining the thought process behind Dynamic Memory (and against overcommit). To view this demo in the keynote video, skip to 33:41. Next, we saw RemoteFX, which wasn't much different from the video that Brian recorded with Tad Brockway right after RemoteFX was announced. We saw 720p video, Aero Flip, and a Perfmon trace that shows how the processing is offloaded to the GPU (which, for the demo, was probably the same NVIDIA FX5800 used in the video Brian recorded). There was even a nice little dig about how "some competitors" use the CPU to handle similar graphics. AhemVMwareAhem. Both Dynamic Memory and RemoteFX are slated to be released in Windows 2008 R2 SP1, which is due late this year. The last thing I thought was interesting is Windows InTune (formerly called System Center Online). Windows InTune gives you the ability to manage desktops via a cloud-based web interface that that will wrap up all that's needed for Windows desktops (Server OS, System Center components, etc…) into a subscription. I talked to a few people at the show that feel that this is where Microsoft wants to go with regards to managing corporate desktops. While I've never been a champion of all things cloud, I have to say that if Microsoft is going this direction, it's going to be hard to fight it. So for now, we'll wait and see, but keep your eyes on InTune. Overall, I think that MMS was a good show for us to attend, especially with the focus on virtual desktops. While I was there, I managed to record some demos from some of the vendors (Quest's vWorkspace 7.1 is already posted) that we'll post in the coming week or so, and I left with a few questions (like how Dynamic Memory pools work and what's actually going on behind the scenes with the XenApp connector for SCCM) that I'll get answered and write about in the near future. Disclaimer: I have not had the actual product to work with (2008 R2 SP1), so what follows is "educated speculation" regarding the dynamic memory feature of SP1. Microsoft added the ability for the OS to handle "hot swappable memory" a while ago. I think it was Vista, but certainly Win7. When they talked about the feature at the time, it was in the context of blade servers where maybe this feature might be used. In my work building the HyperV_Mon tool to monitor VMs inside of Hyper-V, I used interfaces provided by Hyper-V and elsewhere to interrogate what the hypervisor is doing and what the VMs are doing. At the time, I made a note for a possible future feature that looks just like this feature. (I guess I'm not going to ever get around to building that feature now)! Such a feature would depend on software running in the host partition, in my case as a windows service but Microsoft would have more options such as a kernel driver, that would monitor the configured amount of RAM in a VM and the actual use over a period of time. Comparing this to the overall memory usage, one could decide to dymanically reduce the memory in a VM to make more memory available for others. Reducing memory in a VM would require contacting the VM to ask it before taking it (which I never looked into for feasibility, but presumably there is an API to do so), while adding memory would be a piece of cake. Ultimately, this is a resource balancing act that is easily written. This method is in sharp contrast to what memory overcommit technique, where VM memory use is watched where multiple VMs are using memory pages with the same contents are combined so that the physical memory on the box is shared, not unlike how memory for an exe or dll is shared between processes within the OS. By the way, both techniques provide value and are not incompatible. The ultimate virtual desktop host server probably does both of these things. The piece of software that runs in the host partition to monitor resource usage is the SCOM agent. SCOM uses PRO tips and sends them to SCVMM which then talks to the SCVMM agents to do the hot-add and hot-remove of RAM. Supporting my educated guess is the fact that the next SCOM and SCVMM releases will include PRO enhancements. "Â·Policy-based dynamic resource optimization â Ensure optimal utilization of your datacenter resources (e.g. 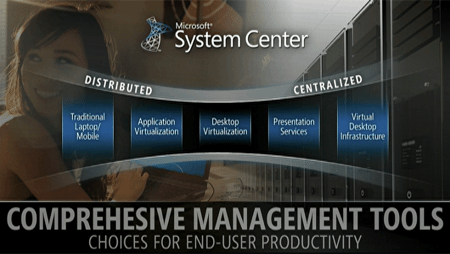 policy driven power management), deeper Operations Manager/PRO integration"